Are you an iTunes user? If that is the case you have surely spent many hours of your free time completing and maintaining your iTunes library up-to-date. And something that you will really hate is that a platform change leaves you without its contents. The solution is called CopyTrans TuneSwift. This is the easiest way to move your iTunes files from one system to another. You will only have to create a backup of your library, no matter if you use iPod Touch, iPad or iPhone. You will then be able to export it to an external storage device or save it in a folder so as to recover it at a later date wherever you want. 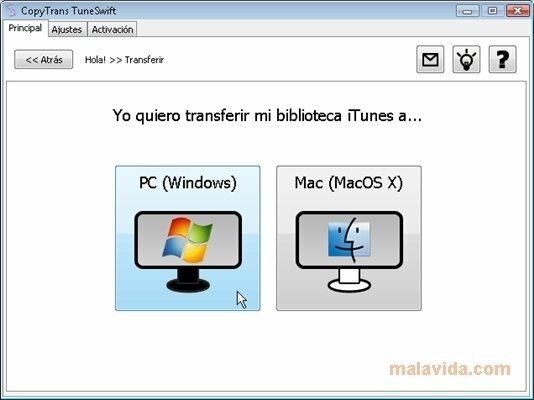 To import and export the iTunes library you can use CopyTrans TuneSwift. Create backups of the contents of your Apple player and recover them on any computer with this simple but useful tool. This download installs CopyTrans Control Center. It is necessary to select CopyTrans TuneSwift from the list to launch the program. This application requires an Internet connection to work. The trial version has certain limitations.